Over 50 years of manufacturing high-quality window & doors. Backed by a Full Lifetime Warranty, including parts and labor. Milgard is one of the largest and most trusted names in home windows and patio doors, serving the Western U.S. and Canada with over a dozen full-service facilities and customer care centers. Our comprehensive network of 3,000+ locally operated dealerships can help you create the home you deserve. Whether you're building a new home or replacing existing windows, our Milgard Certified Dealers can advise you in the window selection process. Designed & Assembled in the U.S.A.
Our windows and patio doors are designed and assembled in the U.S.A. and built to last. Your Milgard windows and doors are covered under a Full Lifetime Warranty for as long as you own your home. You’ll feel confident knowing that the work will be completed correctly by Milgard factory-trained technicians. Every window component, from hardware to window glass, is developed from hours of testing and attention to detail. Milgard has been recognized, year after year, for manufacturing quality windows and patio doors. We make environmental responsibility part of our best practices and can help you do the same. Milgard actively gives back in our local communities to help the neighborhood thrive. 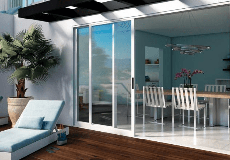 Discover what thousands of homeowners have to say about Milgard windows and patio doors.